Throughout Dante’s ascent from Inferno up through Purgatorio he has the task of remembering to the world those souls whose path he comes across. To accomplish this, Dante looked around and “noticed” his environment, the society in which he lived in. The Latin word notitia means acquaintance or awareness. Notitia is part of the act of divine memory, one of Dante’s purposes. Divine memory is noticing the experience of our senses within present surroundings. For us, reading the Post-Katrina Portrait Stories allows our awareness to expand to include truth, goodness, and beauty as we witness that many volunteers drew closer to the light of the divine in their selfless service. Selfless service is, in some way, a divine remembering of who we really are. An aspect of divine remembering from the portrait stories comes from one ‘peace patrol’ volunteer who said that helping somebody else helps you to forget about yourself. Something is forgotten, and this is like being bathed in the River Eunoe after the inferno of Katrina: remembering and forgetting is an imaginative flow between the Rivers Lethe and Eunoe. When you help somebody else, you really do forget about yourself. I spoke to, hugged and cried with the other volunteers. Peace Patrol (Security) was my 1st job. I love E.C. (Emergency Communities) because it is best at filling the gap. Someone steps up to the plate without the bureaucracy. We can get it done, not put it on a helpline ….spoken by a volunteer. In the Post-Katrina Portrait stories we read about people from around the country moving into action during the tail end of the storm. Volunteers went beyond the “diffused good will” typically shown by moral communities (Margalit, 2002, p. 33). Rather, their unselfishness paralleled devotion, a devotion that drove them to meet the particular needs of hurricane victims in New Orleans. A level of care, typically shown to relatives, friends, and neighbors, was now being offered to strangers. And in the process of survivors’ letting go, they gathered their memories from before the storms to keep the warmth and the feeling of New Orleans alive; at the same time, volunteers cared in the most ethical way, the effect of which prepared them for the light of the beatitude. We remember these volunteers in the portrait stories. Our remembrances can be cultivated as a conscious act of memory, not the randomness of memory that occurs throughout the day. Divine remembering deepens the sensory experience of life, which could be called soul. This way of remembering is akin to meditation, and it is the awakening of heart as a path into soul. One may ask the question that, while it was very moral behavior on the part of individuals, is our government expected to “care” for citizens in similar fashion? If our government responds more effectively to disasters in the future, would we call that “care” or even distinguish it as a moral act? Some people believe that governments do have the responsibility to be moral and to show some degree of ethical care for its citizenry. The concern I have when speaking of memory and moral relations in the same breath is that moral superiority may settle in and then “spirit trumps soul.” Dante might agree. 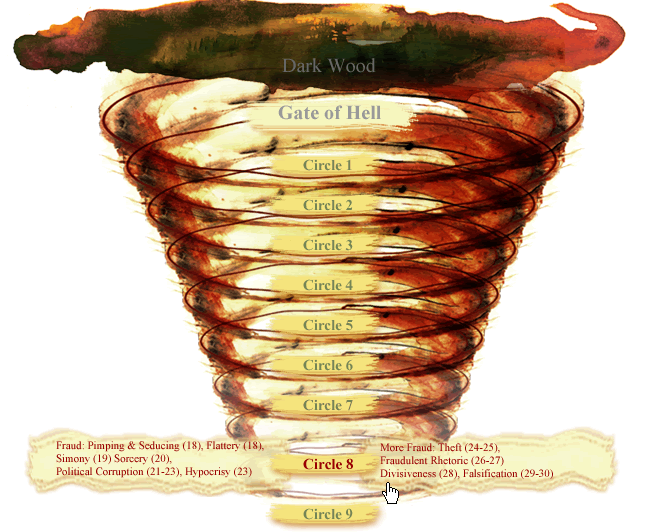 Based upon events in New Orleans, which circle of Hell would Dante have placed our politicians? We cannot forget the moral superiority of government officials who failed to respond appropriately to the natural disaster, thereby adding to the human disaster. Because of political decisions by local government officials, and because our highest federal officials deny leadership in the wake of Katrina, a majority of disaster victims from New Orleans are still displaced. It is a political exile of sorts, although not the political exile experienced by the poet Dante during the socio-political struggles taking place in Florence, during which time he wrote the Divine Comedy as a mnemonic poem to remember the people and events that had taken place there (as well as to memorialize his love of Beatrice). But those displaced from the Ninth Ward also feel the longing and sorrow of exile. Some were fortunate to return, although many have not. Our morality ought to be embedded in care otherwise this tendency towards moral superiority leads to multiple discriminations. My concern is that moral superiority might be at the core of our government’s weak response. The Ninth Ward is an economically poor area, and so elite members of society are led to neglect it due to their belief in the moral inferiority of those in poverty. Why aren’t our elected officials capable of a transcendent vision of freedom and at the same time able to show solidarity with the poor? This displacement is like being in Purgatory, where the path of the River Lethe flows to help souls such as these in their suffering. The lethean task is to consciously remove all memory of the reprehensible actions that occurred in order to heal. In this way we effectively dissolve post-Katrina memories of physical, mental and emotional anguish. This is a form of positive dis-membering which can be called “conscious forgetting” or “letting go” of experience. At the same time and out of the same source from which the Lethe flows there springs in the Divine Comedy another river, the Eunoe, which means “good mind” or “good memory” (Lethe, p. 28). While suffering in the Inferno, those who drank from the River Lethe immediately forgot everything that had happened to them, but that evokes the danger of oblivion. This is why we need to pair our forgetting with our remembering, and drink from the River Eunoe as well. While there is huge value in forgetting in order to find peace, we continue to remember that dignity is deserved by the poorest of our citizens. Although we all suffer from alethia, one hope is that our continued witnessing may serve as moral condemnation for injustice. We remember not only those who died but those who are still struggling to rebuild, recover, and rehabilitate. Divine justice, as we saw in the Divine Comedy, comes in the afterlife and is meted out individually, but this does not dissolve the need for human justice here and now. What chance will justice have on earth if, as moral witnesses, we neglect to remember those citizens still displaced by the debacle? While we have the ability to forget, we also have the responsibility to remember, and through our memory condemn acts of injustice that still occur today as Ninth Ward survivors struggle for affordable housing. We remember because the survivors of New Orleans are not the only people who are to be entrusted with the memory of Katrina. Margalit (2002) would call New Orleanians a natural community of memory (p. 70) since they shared the experience of a hurricane together (and they are the ones who remember Hurricane Betsy in 1965). But Margalit also says it is possible that “we may care for people and for communities we have not encountered nor are likely to encounter in our lifetime” when he writes of a larger ethical community (p. 70). This would include people in solidarity with the survivors of the hurricane. Someone like “moi” living in Los Angeles may still care deeply for a community that she never lived in. Reading the Post-Katrina Portraits is my way of sharing in the memories of Ninth Ward survivors and volunteers in order to keep the stories alive…simply because there are things that ought to be remembered. Even though we are under no obligation to care, we remember because we choose to live in a sane and peaceful society. Margalit (2002) says there is a difference between what we ought to remember and what we would like to remember, that is, “being moral is a required good; being ethical is, in principle, an optional good” (p.105). In Margalit’s view, moral relations differ from ethical relations, and he says “there is no moral obligation to be engaged in ethical relations” (p. 105). Those in solidarity with New Orleanians have a thin relation with them, while New Orleanians themselves have “thick relations . . . anchored in a shared past or moored in shared memory (Margalit, 2002, p. 7). Hurricane survivors in the Ninth Ward are thickly related and share their past memories of previous hurricanes as well as the memory of Katrina. But there is nothing to prevent the rest of us from caring as well, even though we are thinly related to them as fellow human beings. Although with the passage of time it is easy to forget, it would be morally good and psychologically healthy for us to remember even though we have not experienced the painful events firsthand: we can share sympathy for survivors’ suffering. Although Dante’s answers may not be our answers, significant issues raised in the Purgatorio continue to be important in the world today. These include: responsibilities and rights of individuals, leaders, and society; effects of misrule; church-state relations; criminal justice (punishment and rehabilitation); artistic expression and censorship. The focus of this essay is on the ‘remembering’ we may cultivate in regards to the worst civil engineering disaster in U.S. history while at the same time understanding the need for “forgetting’ parts of the experience in order to heal. The disaster in New Orleans is now a part of our historic myth. Hangar (1997) states “the cultural behavior and social activities of New Orleans libres . . . increasingly helped create a distinct free black consciousness and culture” (p. 137). New Orleans has since evolved into a unique city, rich in history and culture, in addition to being an important shipping port in the United States. The memory I am asking us to embody is not sentimental, although many of us have great tenderness for the city of New Orleans. No, the reason for remembering is to re-member the displaced parts of psyche, individually and collectively. To remember is to call back the soul of the city; it is to recognize New Orleans as a sacred city or “the meeting point of heaven, earth, and hell” (Eliade, 1954, p. 15). Yes, New Orleans represents this aspect of a sacred city. Now the question becomes “How are we going to shape our lives as a result of the stories, individually and collectively?” Or are we going to forget, as some people would like to? Alighieri, D. (1307-1308). Purgatorio. In A. Mandelbaum (Trans. 2004) The divine comedy of Dante Alighieri. NY: Bantam Dell, Random House. Eliade, M. (1954). The myth of the eternal return. Trask, W. (Transl.) Bollingen Series XLVI, NY: Pantheon Books. Durham & London: Duke University Press. Dante’s Hell (2007). Retrieved 04/09/07 from http://danteworlds.laits.utexas.edu/index2.html. Godoy, M. (2006). Tracking the katrina diaspora: a tricky task. Retrieved 04/09/07 from http://www.npr.org/news/specials/katrina/oneyearlater/diaspora/index.html.